BERLIN — A top German official on Tuesday floated the possibility of the government temporarily taking stakes in technology companies to head off foreign takeovers as he proposed a "national industry strategy." In a proposal aimed at keeping Germany competitive in a fast-changing business world, Economy Minister Peter Altmaier also backed the idea of "national and European champions." Altmaier has long been a close ally of center-right Chancellor Angela Merkel. 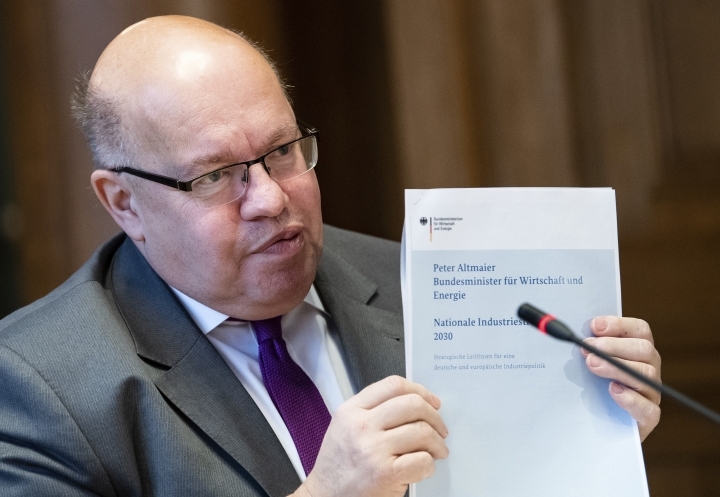 Altmaier said his proposal is meant to kick-start a discussion in Germany and then in Europe on an industrial strategy to handle tough global competition, particularly from China, other Asian countries and the U.S.
German officials and experts worry that the country, Europe's biggest economy, risks falling behind the pace in the development of new technologies such as artificial intelligence and electric mobility. The most eye-catching idea in Altmaier's proposal is the concept of an "investment fund" that could as a last resort be used to protect companies that develop key technologies from being taken over. Details have yet to be thrashed out. Altmaier told reporters that, given the government has stakes in telecommunications firm Deutsche Telekom and mail company Deutsche Post and is still the sole owner of German railway operator Deutsche Bahn, "it must also be possible for the state to participate for a limited time in high-tech companies that are at least as important for our future." But he also stressed that such stakes "must not lead to permanent nationalization because the state is lousy at business." His proposal states that buying new stakes should be balanced out by the government privatizing stakes in other areas. Altmaier pointed to the acquisition of German robotics maker Kuka by Chinese appliance manufacturer Midea in 2016 to illustrate his concerns about German tech firms being snapped up. Altmaier's proposal expressed concern that Germany hasn't created new companies of a world-leading size in recent years. It stated that if a country lacks companies with "the necessary critical mass" to compete against big international rivals, then "this leads de facto to being shut out of a significant and growing part of the world market." It pointed to industrial conglomerate Siemens, Thyssenkrupp, Deutsche Bank and German automakers as examples of existing "champions," along with European plane maker Airbus, and mentioned railways as another challenge. Siemens and France's Alstom hope to merge their rail operations to form a European champion backed by their countries' governments, but European Union authorities appear skeptical about giving it antitrust clearance. Altmaier floated the idea of giving greater weight in competition law to the global, as opposed to national or European, market. Separately, the government already moved in December to tighten the rules on non-EU investments in areas such as the defense and telecommunications sectors, as well as the media, lowering the threshold at which it can consider blocking such plans. That partly reflected increasing concerns about Chinese investors. Altmaier's new proposals drew a mixed response. Reinhard Houben, a lawmaker with the pro-business opposition Free Democrats, said they smacked of "command economy."